My husband was on vacation from the 17th through the 25th of this month. Coincidently I did not post on the blog during this time. Some may suspect that this lack of posting was because I was busy hanging out with my husband (which I suppose may be true). However, truly, my lack of posting can mostly be boiled down to a lack of material. As it turns out when my husband is home to help manage the chaos that tends to saturate my life, my life is actually a lot less chaotic. And as a result, less interesting. It’s times like these that I can rejoice in the fact that I don’t have a live in nanny. Can you imagine how boring my life would be? I wouldn’t get to experience any of the crazy antics that tend to ensue when I take my children out of the house by myself, and I would probably be out of excuses for my hair being in a permanent bun, and for wearing yoga pants (which unless you actually practice yoga, are pretty much sweat pants) a lot of the time. Kind of a no-win situation. Now that my husbands vacation is over, the chaos is back in full swing. The munchkins and I have a nasty cold, which my in-no-way-medically-trained-mother diagnosed over the phone as either bronchitis or pneumonia. She couldn’t do an in-person diagnosis because she refused to come within 3 square miles of my germs. Regardless, due to our cold (which is not probable to be bronchitis or pneumonia), the kiddos and I have been hanging around the house, fighting over the new toys. I’d like to say that it’s just the kids fighting over the toys, but seriously, the Weeble Treehouse that we got for the baby is awesome! You know you want one. 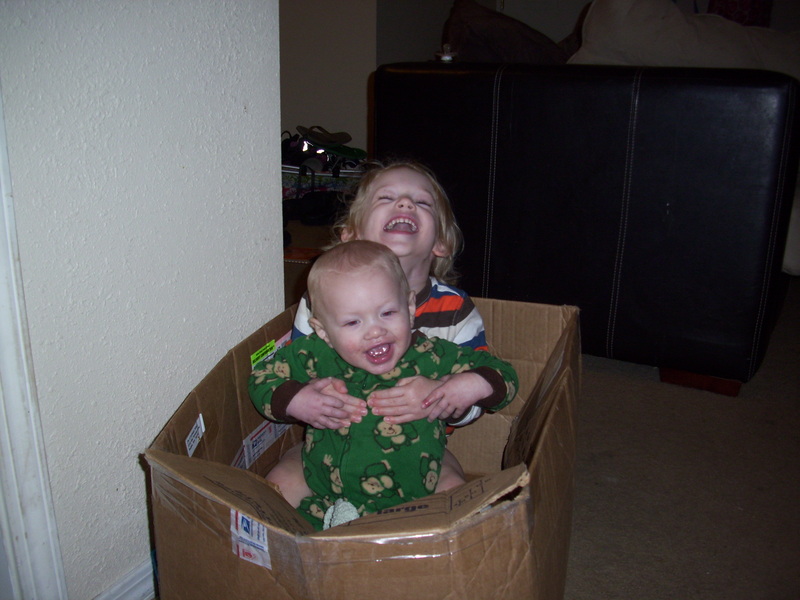 Even with all of the new toys, the most popular playthings in our house this week have been the boxes. Which I think is great. Playing like this: fun! This is The. Best. Toy. Ever. Finding your toddler has climbed atop the new kiddie table, crawled inside the box, and is about to fling himself (box and all) off the side onto his unsuspecting baby brother, significantly less fun. Sadly, there is no picture of this because I felt a need to stop bodily harm from occurring to either child. This scenario has further confirmed the suspicion that while my son has my blue eyes, and my awesome hair, he was entirely bestowed with Daddy’s reasoning skills. Since Daddy is back to work, and since there are still tons of awesome boxes lying around, I predict that more chaos is to ensue. But, as I’ve made clear, chaos makes life interesting. So until school starts back up for me next week, I will be chilling in my yoga pants with messy hair, enjoying the chaos that my children create around me. Ahhh, back to normal.